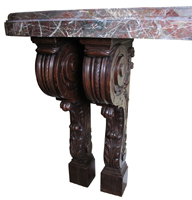 A Fine and Large French 19th Century Louis XV Style Barroque Carved Walnut Wall Console Table with Marble Top. 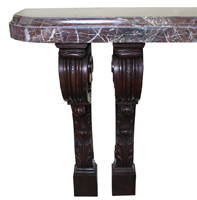 The four individual scrolled and carved walnut pedestals support the large and 4 inch (10.2 cm) thick Italian Rosso Levanto demilune marble top. Circa 1890.